Playsportz offer multi sport pre school activities in Ringwood, Wimborne, Poole & Ferndown including football for toddlers, ball skills and other games. sports for toddlers - a variety of skills designed to help balance, co-ordination and agility. The toddlers football classes are structured so the children develop key skills, gain confidence and learn through play and games. These pre school football & sports classes are coached by David Emes who runs them weekly at the Greyfriars centre in Ringwood,The Allendale in Wimborne, the Village Hall in Corfe Mullen & at Wimborne First School. 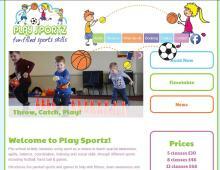 Book under 5s into Play Sportz activity sessions today. The toddlers football classes are filling up fast. Contact Playsportz for pre-school football in Poole, Wimborne, Colehill, Verwood, Ferndown, Ringwood & West Moors. Our Play Sportz coaches can now offer your child a fun filled <a href=">Sports Party for their birthday. We'll organise and run an hour of age related sports and games for 2 - 7 year olds at a venue of your choice in Wimborne, Poole, Broadstone, Ferndown or Ringwood areas. Play Sportz are expanding and they now need a Lead and Junior Sports Coach in Wimborne, Poole, Blandford, Ferndown or Ringwood area. These kids sports coaching jobs will require someone with transport, availability at the weekends and a love of teaching young children. Contact Play Sportz if you're interested in one of these positions.